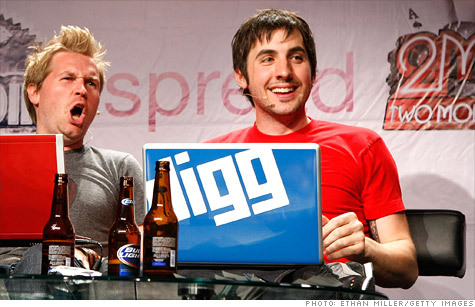 Digg co-founder Kevin Rose (right) during happier times in 2009, with podcast host Alex Albrecht. NEW YORK (CNNMoney) -- Social news aggregator Digg was one of the hottest Internet brands a few short years ago. Now, post-decline, it's been sold to Betaworks for a reportedly paltry sum. Both Digg and Betaworks confirmed the buyout in blog posts. Financial terms weren't disclosed, but the Wall Street Journal pegged the price tag at just $500,000. That's mere pennies compared to the $200 million BusinessWeek magazine said Digg was worth in a splashy 2006 cover story featuring young co-founder Kevin Rose. Digg raised $45 million over the years from from big-name investors including Greylock Partners, Ron Conway and Marc Andreessen. Neither Digg nor Betaworks immediately replied to requests for comment. Digg, founded in 2004, lets users submit links and either "upvote" or "downvote" other submissions. The site quickly amassed a strong following and grew so popular that some sites crashed from the traffic firehose. Reports in 2008 said Google (GOOG, Fortune 500) was in talks to buy Digg for $200 million, but ended up pulling the plug on the deal. As with many hotter-than-hot sites, Digg's reign didn't last forever. Users began to complain about a litany of frustrations, including that certain submitters were gaming the voting system and that the commenting sections had devolved. In 2010 Digg rolled out a site update called v4, but it was full of technical glitches and general changes that users hated -- so much so that some declared an "Abandon Digg Day" and jumped ship to rival service Reddit. New CEO Matt Williams took the helm and wrote a blog post saying Digg would fix some of the issues, but the site wasn't able to regain the influence it once had. Betaworks, which owns online services including popular link-shortener Bit.ly and analytics platform Chartbeat, wrote in a blog post that Digg is "one of the great Internet brands." But Betaworks made it clear that changes are coming. "We are turning Digg back into a startup. Low budget, small team, fast cycles," the Betaworks post said. That team won't be Digg's current staff. Instead, it will be employees from Betaworks' social news digest and app service News.me. Meanwhile, co-founder Rose ended up striking his own deal with Google. In March, the search giant acquired the team at Rose's startup Milk for a reported $15 million.